We’re big sports fans, and while we’re happy watching a game at home on the couch, we also love to meet our coworkers and friends out to catch the action of different games on multiple screens at once. This is especially true during NCAA March Madness. 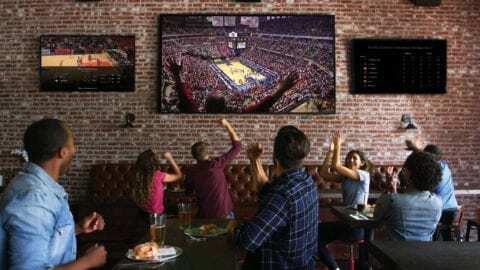 Just in time for the rush of fans to bars and restaurants to enjoy great service and company while they keep up to date with the latest scores and see their bracket advance or get busted in real time, Comcast Business has launched X1 for Business. We’ve taken our award-winning X1 platform, enjoyed in millions of homes nationwide, and brought it to bars, restaurants, retailers, hotels, barbershops, and any neighborhood business where it’s important for patrons to have a great viewing experience. Business owners across New England can now give their customers easy search and navigation, voice control with the X1 Voice Remote and a sports content companion called the X1 Sports App that includes team and players profiles, statistics and real-time, game-specific data. With March Madness also coming to the XL Center in Hartford, Connecticut on March 21st and 23rd, X1 for Business will be on full display at the pop-up pub on Pratt Street that is open to the public during the tournament. Comcast Business will be powering the viewing experience and we hope to see you there! For more on X1 for Business and Comcast Business’s TV solutions, please visit: https://business.comcast.com/learn/tv.